With so few buildable lots remaining in our corner of Philadelphia, it’s refreshing to have the opportunity to design a new house on a beautiful lot in Haddonfield, New Jersey. 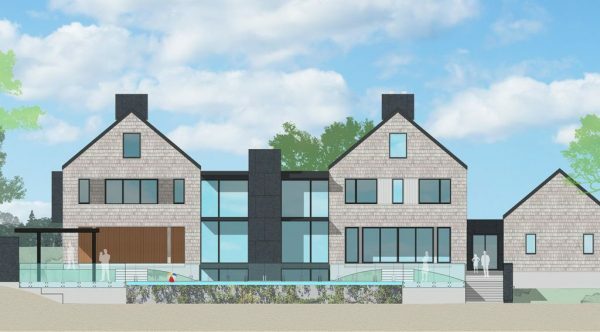 This is the story of what happens when we add to that clients with a clear vision of what they want in terms of architectural style, and their perfect alignment with our design aesthetic. The clients, who are expecting their second child, selected the 3 ½ acre property for its location. Close to family and backing onto a golf course, it’s the ideal spot for them. The problem was, it came with a 1960s ranch house that would not work with their plan for a dream home as a gathering place for family and friends. Though the ranch house is being demolished, the home that will replace it will provide enjoyment for the large, extended family for many years to come. Our clients came to us specifying only the number of bedrooms and that the focus should be on outdoor play. From that start, we developed the program together. This home is truly designed around the outdoors. What’s more, it embodies a couple of decades of design and practice experience on my part. First, it’s a fairly large house, so we’ve broken the mass of the house down into a series of individual volumes to reduce the apparent size and scale. So it’s like a little village; a collection of small houses, rather than one large mansion. The forms are very simple, like a child’s drawing of a house: two stories, a gable roof, chimney, and a couple of windows. It’s this very simplicity that delights us. The intention was to break the massing down while also making it easy to build and minimizing construction costs. There aren’t unnecessary embellishments or flourishes. As a result, the simplicity of the house creates a repose, a restfulness.